The Punakha Dzong is definitely one of the most beautiful buildings of Bhutan known to me. 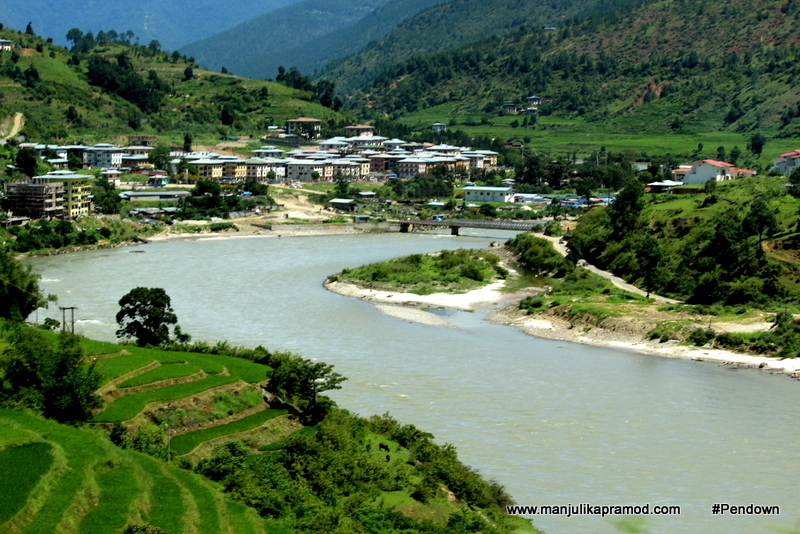 It is located at the confluence of the Pho Chhu (father) and Mo Chhu (mother) rivers in the Punakha–Wangdue valley. From far or near, the sight of the dzong is breath-taking, awe-inspiring and fabulous. I was absolutely in love with its architectural magnificence. Despite several apprehensions, one of the reasons why I made up my mind to participate in the river rafting was that I did not want to let go of my chance to see this Dzong while rafting past it. While rafting in Mo chu river, one gets to see this beautiful backdrop. My travels not only give me new opportunities to discover new places but they also push me to walk out of my comfort zone and venture into the thrills to pump in more adrenaline rush. I have taken my first baby steps and realization towards adventure tourism in last few years. While the submarine dive in Mauritius was one-of-its-kind experience, the wildlife safari in South Africa was another magnificent indulgence. In Bhutan, the hike to Tigers Nest gave me a new high but the white water rafting and river camping will always remain to be most memorable. It added to newer perspectives. All of these happen to be my firsts. I had never done rafting and neither had I camped by the side of a beautiful river. Rafting sounded scary while the idea of river camping made me uncomfortable. Since I call myself a comfortable traveler, I usually have too many inhibitions but to be a traveler, one must be ready to accept and adapt to new things on the way. So when our itinerary said that we would be camping by the river and sleeping in the tents, honestly, I was not sure how clean the surroundings would be, whether there would be enough space in the tent and majorly I was concerned about the loo, but I still wanted to take this experience. For a long time, my idea of travel was mostly about doing things in a luxurious and comfortable way. But now I love to experiment too. In some way I feel blessed that I get such opportunities where I can undo myself and my prejudices. This is one such interesting and honest story. 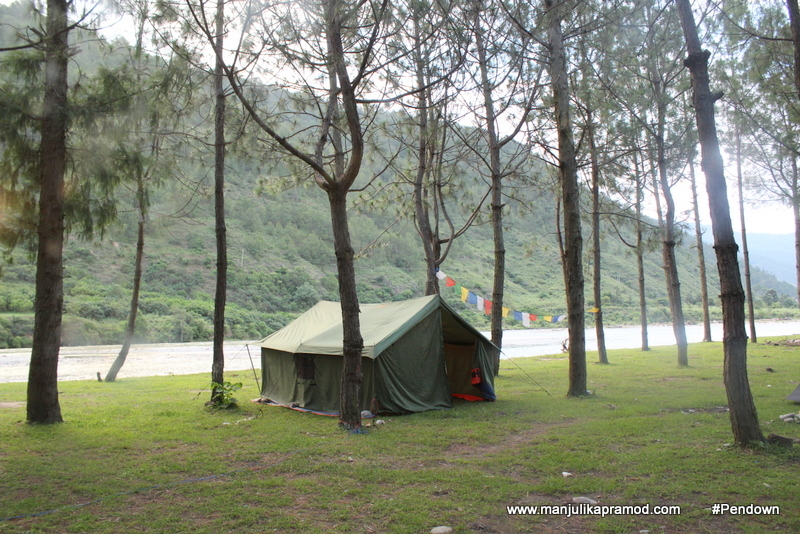 This is where I camped in Bhutan by the side of Mo chu river. This is an early morning sight. Water activities always freak me out and I was tensed about going out for rafting. I googled and read about it a night before. The more I read about it, the more I learnt that this river journey will take me through one of the best and secluded scenic beauty of Punakha. I did not want to miss it but I was scared of the rapids. I feared that I might fall down in the river. However, I held on to my wits and decided to take things as they came. When we reached the starting point, put on our gear, met the crew, and went through the rules about how to stay safe while rafting, I felt better. As I made my way towards the raft, I was excited but equally nervous. When our guide and my friends assured me that this was going to be a unique experience and later I would love it, I gave it a shot without thinking much. We all hopped on the raft and took our seats. The crew gave us a soft practice of paddling and emphasized on the fact that it was all about group activity. We all had to listen to his instructions and synchronize our efforts in the same direction. Even before I could settle down, the first splash came and soaked us with its charm. Now, I felt much better and at ease with water. In some time, I began to enjoy and look forward to the splashes. As we moved further, there were gentle flows as well as powerful gushes of water. Soon we were talking about giant rapids and huge splashes! Two of my friends on the group dared to jump in the river too. Well, I couldn’t dare to do that, I loved their adventurous spirit. The rapids in the Mo chu river in the month of August were not very high and scary. I can say so because there was not a single moment when I was scared or I panicked for any reason. I happily laughed through it, enjoyed the ride, looked through the dzong and had my meditative moments. I am super glad that I did it. My first attempt at river rafting has taken away my fears and now I am prepared for future adventures. 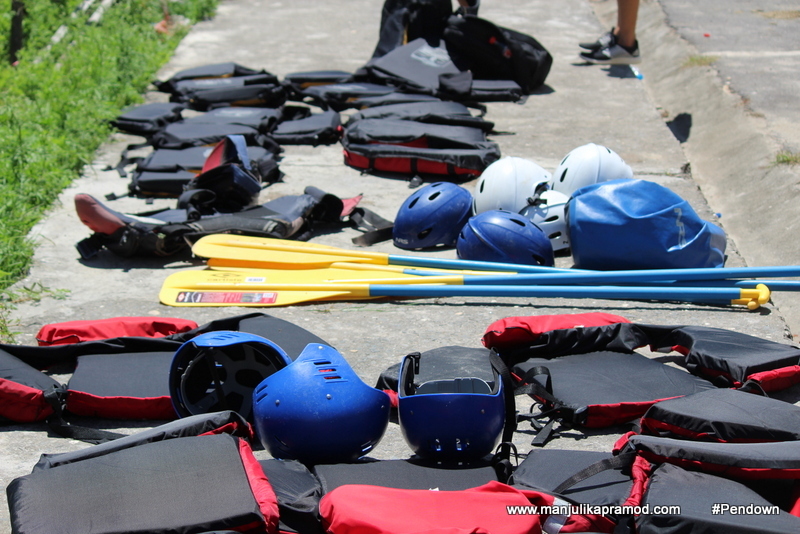 River rafting – Pick your gears right!! The rafting crew in Bhutan was wonderful and they made the float down the river Mochhu (Female River) all the more exciting. We even sang songs with them. 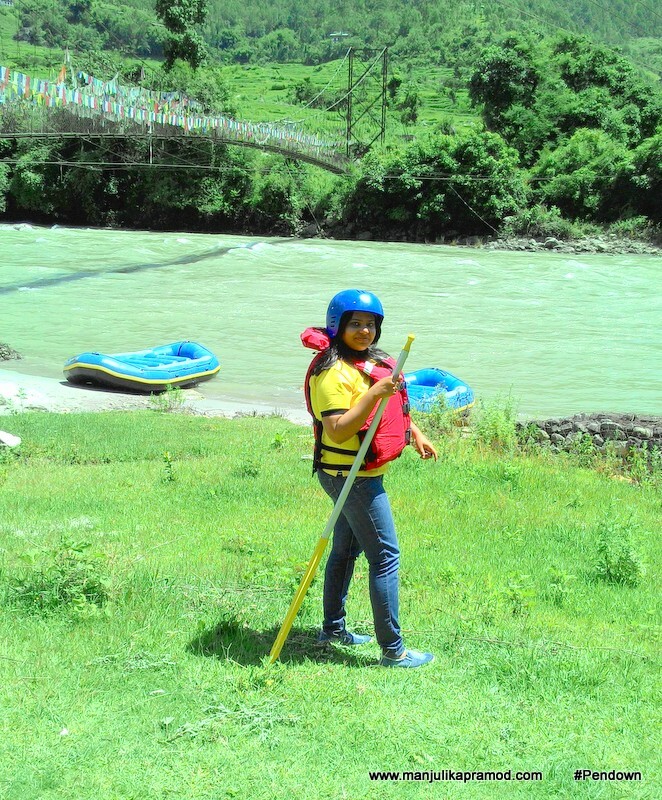 I will always recommend river rafting in Punakha for its wonderful scenic views. For me, it was not just an adventurous day but the night was thrilling too despite being filled with the stillness and solitude. 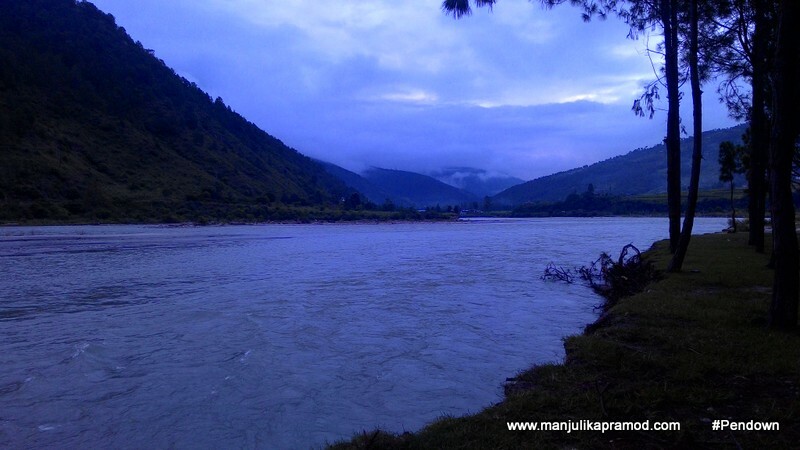 It was quite an experience to be put to sleep by the gurgling sound of the Mother river of Bhutan. When we reached the site, it was almost time for sundown. The setting was beautiful and very natural. The beauty of the valley and the close proximity to the river set the mood instantly. 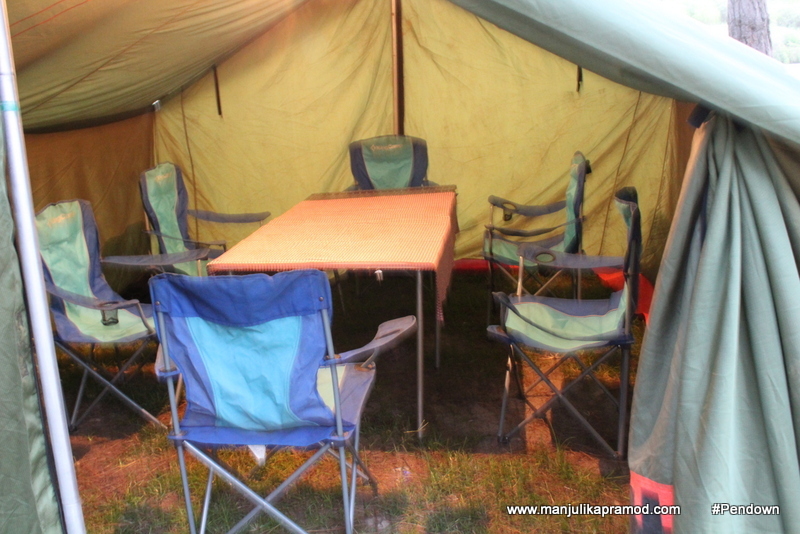 Our tents were laid out and everything around looked easily accessible. There was a small moveable kitchen in the van and our little dining room was also neatly set. I looked around for a restroom and soon located it at the extreme corner. I had never spent a night like this and I was not sure how I would breathe in a cramped space. Little did I know that our tent was aptly made to accommodate more than 2 people and there were enough pores to let you breathe. I had a mixed expression on my face and I really didn’t know what to expect. At one side, I quite liked the idea of sitting by the river, chatting with friends, eating in a cozy room by the side of the river and spending the night gazing the stars, I was little unhappy about the dogs, the and the washroom (It didn’t have a light and we used torchlights while using it). The setting by the river was as gorgeous as this. I looked into the tent closely! Our small dining room by the river! In the night, my friends seemed more comfortable than me. I had weird thoughts in my mind. 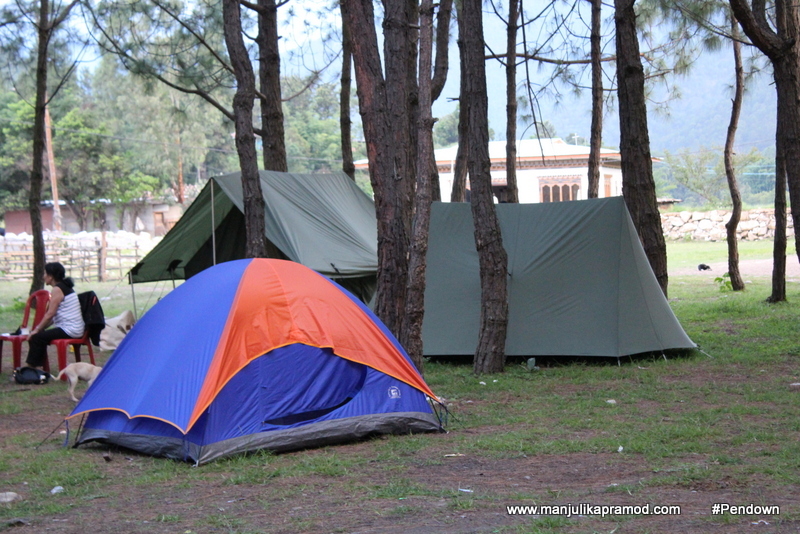 I feared the insects in the grass and sometimes I even thought how could I sleep in total darkness in the tent. Once, I spread my body to relax and concentrated the flow of the river, I began to feel much better. My mind was relieved of the stress and soon I began to feel warm and cozy. I was sharing the tent with another travel blogger and my friend Swati. We talked about several things and she made me realize that these experiences also had their own essence. I listened to her carefully and soon dozed off. I wouldn’t say I had a great sleep but yes it was a quite a memorable morning. For a beautiful morning like this, so up close and personal with nature, I would definitely love to do river camping again. 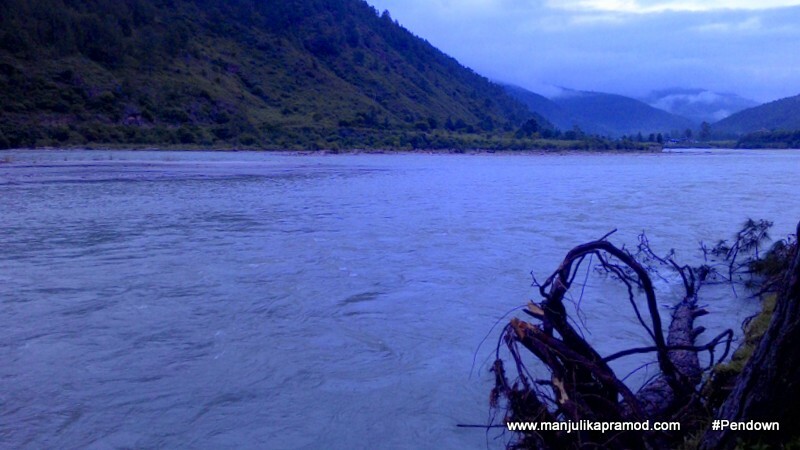 Whenever you are visiting Bhutan, you must do both – River Rafting as well as Camping. Overall, it was a great trip to Bhutan with BHUTAN BOOKINGS. Haha, Reminds me of the fun time we had! Both of us did something we were scared of doing….Different fears but the emotion was same. 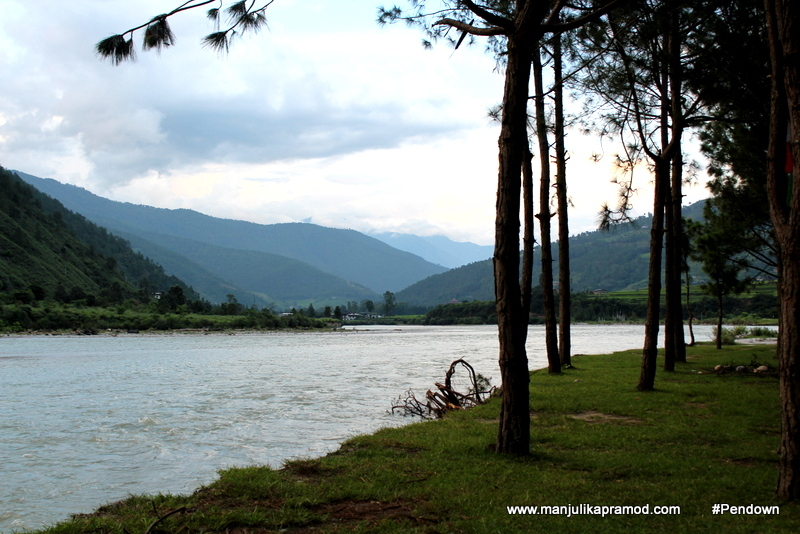 Damn, I miss Punakha so much! 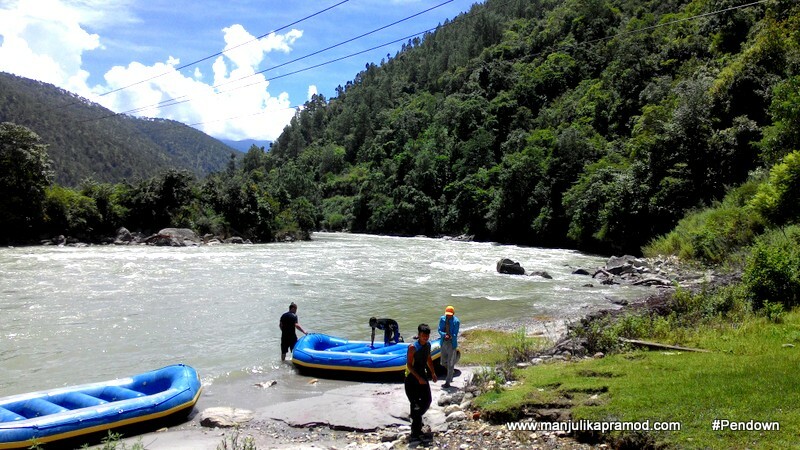 I have experienced the joy of river rafting at Rishikesh. After reading ur post, i am very tempted to try this one out. Rafting with a scenic view! Wow! 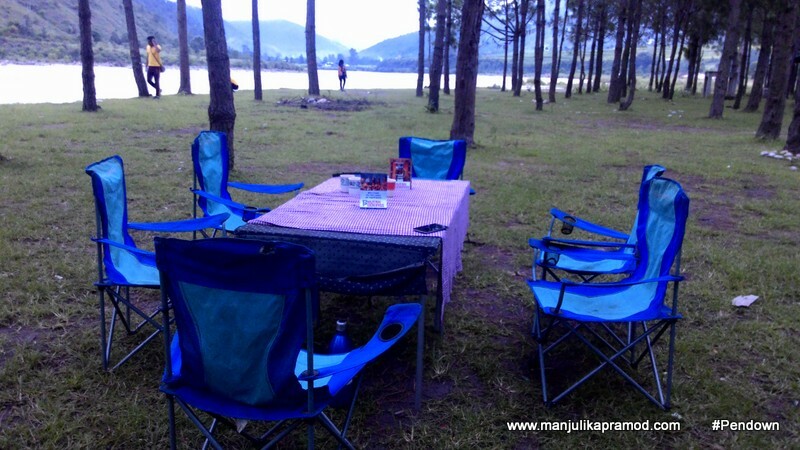 Could you tell me about the rates for camping for one night at Punakha along the river?